Backstreet’s back, alright? 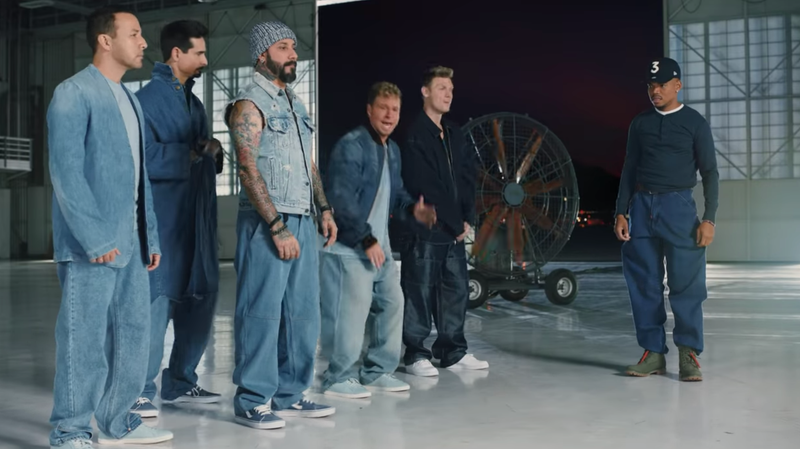 As part of the promotion for their newly released DNA, the boys otherwise known as Brian, Nick, Kevin, Howie, and AJ have been slowly creeping their way back into the zeitgeist via music videos and a number of cheeky, self-deprecating TV appearances. First up, we’ve got a teaser for an upcoming Doritos Super Bowl ad that pairs the boy band with Chance The Damn Rapper, who, in a hilarious subversion of each other’s cultural currency, finds the latter auditioning (poorly) for a spot in the group. Stick around until the end of the teaser to hear Chance’s take on the “I Want It That Way” refrain. It’s one of those late-night bits that sounds amusing on paper, and then you realize you’re just watching grown men cluck for a minute and a half. Kudos to them for being so damn game for it all, though, and even doubling down on it later with a “why did the chicken cross the road?” gag. Hey, at least they got to hang with Chance.